Tag line: "The most dangerous jaws on land!!!" 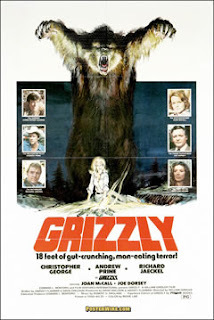 The sole purpose of Grizzly, a low-budget horror film released in 1976, was to cash in on the incredible success of Steven Spielberg's Jaws, and much to the filmmakers delight, the movie did more than just copy the Jaws formula; Grizzly also mirrored its box-office success. Park Ranger Michael Kelly (Christopher George) finds himself pitted against a 2,000-pound grizzly that’s making a snack out of campers in the area. To help him kill the monster, Kelly enlists both Scotty (Richard Jaeckel), a skilled outdoorsman who knows a little something about bears, and helicopter pilot Don Srober (Andrew Prine), whose chopper proves useful in tracking the grizzly. But can these three bring down the beast before it has a chance to kill again? The similarities between Jaws and Grizzly are numerous, from the film’s setting (a vacation hot-spot on the eve of its busiest weekend) to its conflicts (Christopher George’s park ranger has to fight both the killer bear and local big-wig, Kitteridge, played by Joe Dorsey, harkening back to the problems Chief Brody experienced with Amity Island’s short-sighted officials). We even get an occasional glimpse of the action from the bear’s perspective, as he makes his way through the trees (reminiscent of the suspenseful underwater scenes in Jaws). As for the grizzly attacks themselves, they’re fairly bloody. The first to fall victim are two young girls, Margaret (Mary Ann Hearn) and June (Catherine Rickman), who are torn to shreds while setting up camp. Margaret even gets her arm ripped off, yet this pales in comparison to what happens to poor little Bobby (Brian Robinson) later on. With plenty of tense moments to go along with the violence, Grizzly leaves you terrified of the woods in much the same way Jaws made you fear the water. Even the tag lines for Grizzly don't bother hiding the fact it owes everything to Spielberg's now-classic shark story (“The Most Dangerous Jaws on Land!” one poster cried out). But in the end, it didn't matter how blatant a rip-off Grizzly was; audiences gobbled it up like there was no tomorrow. The film took in millions at the box-office on its way to becoming the most successful independent film of 1976. The lesson learned from these 2 movies is clear: whether on land or in the sea, '70s audiences loved watching animals eat! I need to watch this again. I love the "Jaws" mock movies of the 1970's Great post! Not a very good film. I saw it first-run when I was one year out of high school. I immediately noticed that it was shot in the area where I had gone to high school, and a place for which I was intensely homesick in the mountains of north Georgia. I had been forced to move to the low country of Georgia on the coast and I could not have hated that place more. So the film ultimately left me in depression over the images of the mountains I'd left behind.